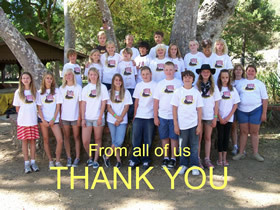 On Sunday June 24, 2007, during the Midsummer celebration at Vasa Park in Agoura Canyon, California, with a mixture of excitement and anxiety, twenty six children of Scandinavian heritage converged to attend the week long 2007 VIKING VILLAGE YOUTH CAMP. Children from Southern California, Utah and Nebraska were in attendance under the direction of Ann Heinstedt, with the assistance of Gary, Gunlog and Bjorn Spaberg, Rolf and Thomas Jahn, Sheryl Pages, Lori and JJ Schetter. The Viking Village Camp started in the evening with a delicious dinner and dessert for children and parents. Thereafter the six day camp was successfully underway. During the week long camp, Vasa children were given the opportunity to learn about their Scandinavian heritage. In the daytime, the children participated in the Vasa Park Camp Keystone’s activities which included archery, go-carts, waterslide/swimming, rock climbing, horseback riding, paddle riding on the river, and riding the new and famous Zip Line. In the evenings, they children were immersed in Swedish Culture such as learning the Swedish language, dancing, singing and various forms of Scandinavian art with music provided by the magic violin of Chuck Pages. Breakfasts and dinners were prepared by Gary, Gunlog and Bjorn Spaberg with the assistance of Lori Schetter, Thomas Jahn and Sheryl Pages. The children had the opportunity to enjoy night time swimming, horseback riding and riding go carts. Desserts of Swedish pancakes and heart shaped waffles were an unexpected treat. In the evening of Friday, June 29, the week concluded with a Pizza party for the children and their families.. There were lots of hugs and goodbyes, phone numbers and email addresses exchanged and all the children look forward to the opportunity to participate again next year.